Every week, it seems there is new cutting-edge research that confirms the brain benefits of physical activity. For example, a recent study reports that sustained aerobic exercise increases the birth of new neurons (neurogenesis) in the brain. “Exercise triggers new cell growth in the hippocampus (memory centre), in the cerebellum (motor function), and in the frontal lobes (executive function). The growth of new neurons is called neurogenesis. Contrary to the original idea that antidepressants (especially serotonin reuptake inhibitors) work solely by keeping serotonin in circulation longer, the latest research shows that the key to their effectiveness may in fact lie in neurogenesis. Like exercise, antidepressants work by stimulating cell structures associated with anti-depression to grow and strengthen. Researchers from the Department of Psychology and from the Department of Biology of Physical Activity at the University of Jyväskylä in Finland studied the effects of sustained moderate pace running, high-intensity training, and resistance training on the adult hippocampal neurogenesis in adult male rats. In February this year “Physical Exercise Increases Adult Hippocampal Neurogenesis in Male Rats Provided It Is Aerobic and Sustained,” was published in The Journal of Physiology, offering more proof about the power of aerobic exercise to optimize the structure and functional connectivity of the brain. In recent years, there have been a variety of reports that physical activity stimulates neurogenesis, however, it remained unclear what specific types of physical activity best promote neurogenesis. According to this new study, it appears that only sustained aerobic exercise improved hippocampal neurogenesis in adult animals. Compared to sedentary animals, the rats who ran voluntarily on a running wheel had 2-3 times more new hippocampal neurons at the end of the experiment. 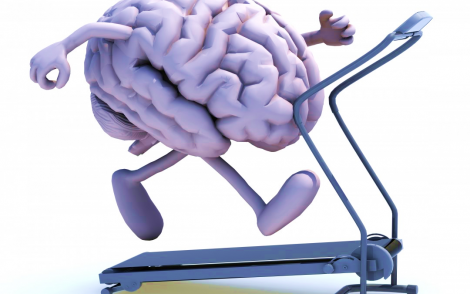 The researchers conclude that promoting neurogenesis via sustained aerobic exercise may improve learning and memory. Although this study was conducted on animals, the researchers believe that sustained aerobic activity can also increase the neuron reserve of the hippocampus in humans. If sustained aerobic exercise isn’t currently a part of your routine, I hope these findings will motivate you to become more physically active. Increasing your number of brain cells not only improves learning and memory in the short-term, aerobic exercise can also have long-term neuroprotective benefits against cognitive decline as you age. Lets get going with the human version then!